← North Raleigh Gets A Cheese Shop! TerraVita Food & Drink Event – Tickets on Sale Now! For the first time TerraVita is offering a limited number of 3-day passes for $425 – The Whole Shebang – providing access to exclusive events. The pass includes admittance to three private, non-ticketed events and parties, including an intimate afternoon event at [ONE] restaurant in Chapel Hill with Chefs Kim Floresca and Daniel Ryan and two additional North Carolina chefs – Vivian Howard from Chef and Farmer in Kinston and Scott Crawford o Standard Foods and Nash Tavern in Raleigh. Also included is a hands-on bread baking class led by Lionel Vatinet of La Farm Bakery and author of “A Passion for Bread: Lessons from a Master Baker,” and a special TerraVita After Party at The Black House at Straw Valley in Durham with Master Sommelier Fred Dexheimer and Chef Adam Rose. The Southern Harvest Dinner on Thursday, October 9, will bring together chefs and producers from across the Southeast for an outdoor feast at Southern Season in Chapel Hill. Chef Kevin Johnson from The Grocery in Charleston, SC, and Weathervane chef Spencer Carter will collaborate with Border Spring Farms’ Craig Rogers and his grass-fed lamb for a casual dinner paired with craft beers, sustainable wines and live music. The cost of each ticket will be $85. Following the Southern Harvest Dinner, the North Carolina Season Premiere Party for A Chef’s Life on October 9 will bring together the directors, producers, staff and stars of the show to celebrate the kick-off of the second season of the PBS award-winning series with family, friends and ticketholders. We’ll toast A Chef’s Life’s recent Peabody award – the broadcast equivalent of a Pulitzer Prize – and their nomination for a James Beard Foundation broadcast award. The Sustainable Classroom – a hallmark of TerraVita – introduces culinary workshops, food and beverage tastings, demonstrations and intensive panel discussions. Classroom sessions range in topic, but share a focus on sustainability and feature visionary producers, chefs, journalists and cookbook authors, including James Beard Foundation’s 2014 “Best Chef Southeast” winner Ashley Christensen of Poole’s Diner in Raleigh. Participants may choose to attend up to three 1-hour and 15 minute classes, which take place Friday, October 10, from 9:30am until 2:30 pm; each ticket costs $60 and includes 3 classes. The Carolina Table: East Meets West – TerraVita’s celebration of the rich culinary scene from NC’s coast to mountains – takes place Friday evening with a family-style seated dinner prepared by some of the most exciting talent in the region today. Chef Scott Crawford of the soon-to-open Standard Foods and Nash Tavern in Raleigh, Ben Adams of Piedmont in Durham, Matthew Dawes of The Bull and Beggar in Asheville are just a few of the chefs who will collaborate on a farm-to-table dinner, featuring the finest farms and artisanal producers in the state. Guests will dine with local food artisans whose cheeses, meats, artisan breads, brews and spirits will be highlighted in each dish. The cost per ticket is $100. TerraVita culminates on Saturday, October 11 with the Grand Tasting on the Green, this year featuring live chef demonstrations for the first time, alongside tastings from 45 exceptional chefs & artisans from across North Carolina. Additionally, more than 100 sustainably-produced beverages from around the globe will be served, including organic coffee, biodynamic, organically-grown and natural wines, local microbrews and distilleries. Guests also will enjoy cookbook signings and intimate interaction with chefs, artisans and beverage producers from across the state. The all-inclusive ticket is $75; designated driver tickets are available for $60. As in years past, TerraVita has set the additional goal of producing a zero waste event by employing the intensive use of compostable and recyclable goods and recycling nearly all of the waste produced at the event, made possible by a partnership with Orange County Solid Waste Management and Brooks Contractors, a commercial composting company located in Chatham County. 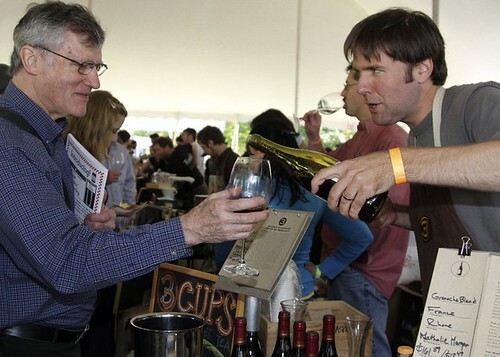 For more information please visit www.TerraVitaEvent.com or email info@TerraVitaEvent.com. For updates, follow @TerraVitaFoodie on Twitter and Instagram. I went to the Grand Tasting on the Green last year, well worth the price of admission. As promoted, definitely a not-to-miss event for food fans.